There’s probably nothing more annoying than being kitted up and ready to go, then going to fire up the bike and the bloody thing won’t start. Arrgggh! Getting all hot and flustered in your bike kit, you think about the options. Bump it? Turn the ignition on and off again? See if you can jump it from the car? Maybe whip the seat off and stick the charger on for 20 minutes? The only thing more annoying than a dead battery, is the fact that you probably could have done something to prevent it. When you’re stood there in your bike kit, getting all worked-up, you really have left it too late. While batteries do have a hard life, it’s not wear and tear or age that are the most common causes of them failing; it’s sulphation. We’re all guilty of leaving our bikes parked up for weeks on end and it’s during this time that sulphation occurs and it’s this sulphation that first weakens and eventually kills your battery. There are countless motorcycle battery brands. It’s hard to pick the best motorcycle battery as it depends on your budget and what you want from your battery. One bit of advice is: avoid the cheap batteries on eBay – they are a false economy. Japanese manufacturer Yuasa claim that over 90% of bike manufacturers choose Yuasa as their standard battery supplier. They’re not always the cheapest but they’re a safe bet. 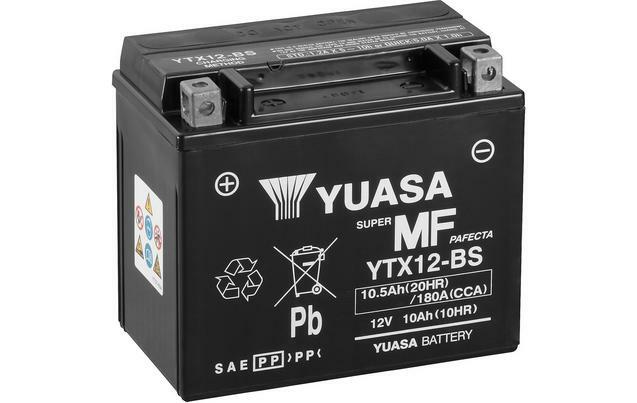 Yuasa make Lead Acid and Lithium batteries. Manufactured in China, Dynavolt are a good brand and are usually quite a bit cheaper than Yuasa. They make both Lead Acid and Lithium batteries. Japanese manufacturer Shido are one of the leading suppliers of Lithium-based motorcycle batteries. A few years ago, Lithium batteries were around three-times the price of a Lead Acid but these days they’re only around 20% more expensive. You can buy these batteries from your local motorcycle dealer or reliable online retailers, like SportsbikeShop or Amazon. Almost all motorcycle batteries these days are 12v. Back in the day, when you were just a twinkle in the milkman’s eye, batteries were 6v. Classic bikes obviously still use 6v batteries but can be converted to 12v. You’re probably more likely to find a 6v battery in a lawnmower or mobility scooter (although most of these old grinners are secret speed freaks and their powerful electric pavement chariots run 12v too, so mind your ankles, they’re coming through!). If you’ve ever bought a motorcycle battery and had to add a liquid into it, then you’ve had a ‘flooded’ battery. The liquid is sulphuric acid (it stinks, right?). Due to the fact these batteries aren’t sealed (yes, you push a lid down over the cells once you add the acid but it’s not totally air-tight), the water element of the aic does evaporate over time and can require topping up. These days, VRLA batteries are the most common ones used. These are ‘sealed’ and supplied pretty much ready to go – you just need to stick it on a charger to ensure it’s fully charged. The benefit of a sealed battery is the fact it is ‘maintenance free’ – the battery acid gets heated in use and any liquid that evaporates won’t escape the battery unless during extreme conditions. The downside is that if you do boil it over, you can’t add in more acid – it’s a goner. AGM stands for Absorbed Glass Matt – essentially it’s a regular battery but there’s glassfibre between the plates which acts like a sponge. 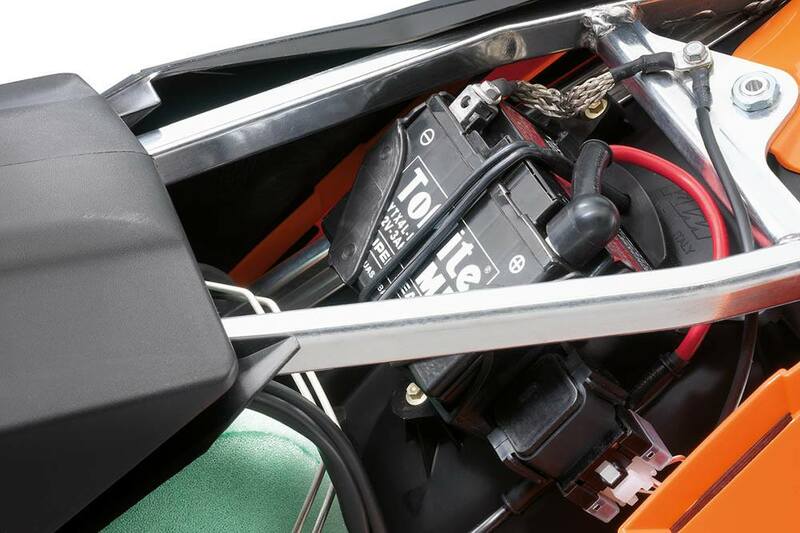 Due to the glass fibre, AGM batteries have better control over the acid and so plates can be closer together, meaning you can have a more powerful battery for a given size, compared to a standard battery. A gel battery is a VRLA battery with a gelified (good word) electrolyte. Essentially the battery acid is mixed with a gel. The advantages of this are that the battery resists vibration damage and also can be positioned at an angle – as the acid won’t escape. Gel batteries are also less prone to sulphation, meaning if you’re the sort of person who forgets to charge your battery, gel is a good option. Lithium (lithium iron phosphate) is the new kid on the block. Lithium-based batteries are used in modern technologies from mobile phones to electric cars. They are much more expensive than a lead-acid battery but there are many advantages of a lithium-ion battery. One of the most obvious is their weight and size. A typical lead-acid motorcycle battery for a litre-superbike weighs around 4kg, a lithium equivalent weighs around 750g. Lithium batteries have a better cranking power and a longer life than a lead-acid battery. They don’t sulphate, either – so if you are rubbish at keeping your battery topped-up, a li-ion battery is a good option. Let’s be honest. We don’t love our motorcycle batteries like we love our engines. A battery is all fine and dandy when it works but the son of a devil when it doesn’t. But let’s show it some appreciation, a motorcycle battery isn’t just there to get the engine started. On a typical motorcycle, it has five different roles to play. – Starting – Supplying power to crank the engine over. – Lighting – Delivering power to the lighting system without the engine running. – Ignition – Supplying the ignition system with power while the engine is cranking. – Charging – Absorbing any spikes in power and stabilising the bike’s voltage . – Support – Supporting areas like the bike’s ECU or immobiliser when the engine isn’t running. What do the numbers on a motorcycle battery mean? The first few letters YTX in this case designate the manufacturer and the type of battery but as all manufacturers have different codes, it’s not that useful. The number 12 designates the size of the battery case (and often the number of cells in the battery). This number often relates to the CCA (Cold Cranking Amps) and Ah (Amp Hours), i.e the power of the battery. Finally, BS in Yuasa’s case means ‘battery sealed’ and tells us it’s a VRLA, maintenance-free battery. You might also see the letter H in your battery after the number, showing it is a high-output version of that battery, usually with a higher CCA figure. What’s the difference between a cheap and expensive battery? Generally speaking, cheaper batteries use thinner lead plates to cut costs. This means it will discharger at a faster rate and require more charging cycles which in turn reduces the battery life. A quality battery brand means your battery will be built with components that will last a lot longer. Don’t skimp (too much) on your battery. Why won’t my motorcycle start? A motorcycle battery is a ‘live’ product, that is to say, once it has been commissioned, it is giving off energy, discharging. A by-product of this process is sulphation, so if you don’t keep your battery charged (either by riding the bike or using a battery charger), it will eventually get to a stage where the sulphation causes a short-circuit and you won’t be able to start your bike – or recover your battery. How long should a motorcycle battery last? Correctly maintained, a motorcycle battery should give you 48 months of use. However if you don’t ever charge it and rarely use the bike, it could be dead within 6 months. If you rarely use the bike and don’t have access to power where the bike is parked – it’s worth removing the battery and giving it a full charge every couple of months. Or even better – get out and ride! Do I need to charge a new motorcycle battery? To give your bike’s battery the best start in life, stick it on a motorcycle-specific battery charger when it’s new and top it up until it’s fully-charged. Your bike won’t be able to fully-charge a battery in the way a charger can. Can I use a car-charger to charge my battery? In most cases, a car charger will damage your battery, as car batteries require a higher current. Most motorcycle battery chargers are 0.8 to 1.2 Amps whereas most car chargers are between 2 and 5 Amps. If you are in a desperate situation and your car battery charger is for a small car battery and the output is under 2 Amps, it’ll charge fine but try not to make a habit of it! What do I use to top-up my motorcycle battery? The only battery you’ll need to top up is a non-sealed (flooded) motorcycle battery. The acid itself doesn’t evaporate but the water-element of the acid mixture does, leaving a more concentrated solution. Top it up using distilled water (boil a kettle, let the water cool then use that). A quality battery charger – like this CTEK one – https://amzn.to/2MNVxx4 will show you when your battery is charged – the charger goes into float mode and only adds power when required. If you want to see the actual output of your battery, buy a simple voltmeter and put it across the battery terminals with the ignition off. 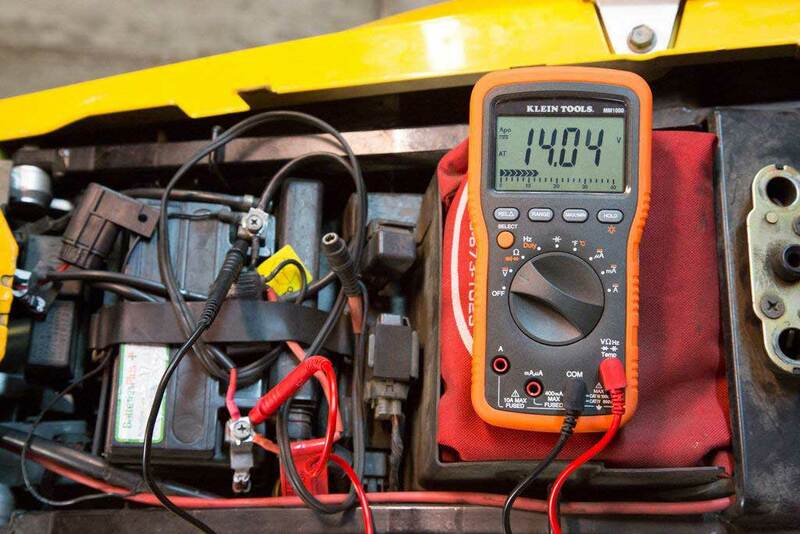 A healthy 12v battery should read over 12.5 volts. When you start your bike, the voltmeter reading shouldn’t drop below 9 volts and when running, should read over 14v. If it’s not showing 14v when the engine is running, it won’t be charging well, the alternator may not be running efficiently or the battery may be on its way out. If I disconnect a motorcycle battery will it still go flat? If it is a lead-acid battery, then yes. As soon as a battery has been commissioned (i.e the acid is in place) it will be discharging. It will, however, discharge less quickly than if connected to a bike, as even with the ignition off, there may be a tiny draw of current from the battery (powering things like the immobiliser). A lithium-based battery will also go flat if disconnected but it will take a lot longer to lose its power and won’t sulphate, meaning you can charge it up again years later. Can I use a smaller battery in my motorcycle? If you’re really in a pickle and can’t lay your hands on the correctly-sized battery, then a smaller one will work. However if it’s too small, it won’t have the CCA required to turn over the engine. Generally the bike is designed to suit the battery so a smaller one might be too small for the terminals to reach or it might wobble around in its slot. Can I bump-start my bike with a flat battery? If it’s a ‘modern’ bike with fuel injection and the battery is dead, then no. If you can get the ignition on (and hear the FI prime) then you might be in with a shout. Hopefully you’re at the top of a really big hill, cos it might need a few runs before it fires up. Firstly, your regulator/rectifier could be dead. If you get the bike running, rev the engine. If the lights brighten, your reg/rec is probably OK. If they dim, the reg/rec might be on its way out or dead. Secondly, your battery terminals might not be on properly. It used to be that you could fit your battery, your lunch and a couple of copies of Razzle under your seat but these days, space is as a premium and batteries are even more fiddly to remove and replace. When we drop a battery bolt or one of those fiddly square nuts, we use this magnetic pick-up tool https://amzn.to/2MMQu09 to save the day. Honestly, it’s a life saver. As fiddly as it is to fix your battery terminals in place, don’t cut corners; if a terminal pops off, it could leave you stranded. Less common these days but an aftermarket alarm or immobiliser is a prime suspect in the mystery of the flat battery. If you have one fitted, make sure the wires aren’t loose or shorting out anywhere. The noise you can hear isn’t the battery clicking but the starter solenoid. This solenoid is the first thing the receive power from the battery and it’s a relay that then opens the solenoid but there isn’t the power to turn the starter motor. The only good news in this situation is that the battery is probably still in a state where you can rescue it but you need to get it straight to A&E – dig out your charger, quick! What’s the best 12v motorcycle battery charger? I can’t claim this CTEK motorcycle battery charger is the best but I’ve used loads over the years and this CTEK does the job brilliantly. From reconditioning old batteries to maintaining batteries on my bikes and my car – it’s a neat bit of kit. I’m laying up my bike over winter – should I start it every now and then to keep the battery charged? In short, no. The alternator will only keep the bike’s electrics running and will barely top up the battery. Your best bet is to plug the battery into a charger or disconnect it completely to ensure it won’t run flat from any drain in the system. In order to research and write this article we referenced the following sources.